Not too long ago, scientists used to believe that “tool use” was one of the characteristics that set humans apart from all other animals. Chimpanzees were the first species observed with tools — Jane Goodall saw chimps using sticks to extract edible termites from underground tunnels. More recently, chimps have been observed making and using spears on other prey. Bird species also make tools to forage. A warbler species on the Galapagos uses thorns to probe under bark, and scrub jays make and use hooks to retrieve edible items — to name a couple of examples. Marine biologists have also documented bottlenose dolphins using tools. 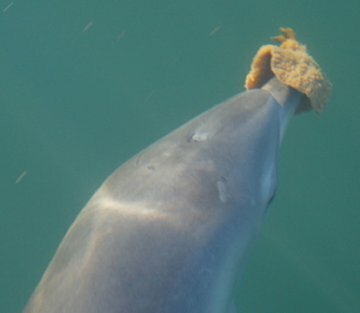 Scientists say that dolphins in Australia’s Shark Bay wear marine sponges on their beaks like a glove, to protect their sensitive beaks when foraging along rugged ocean bottoms. Poking around in deep water carries the risk of stings from bottom dwellers. As usual, the entire article contains more information.